We value your custom and we hope you shop with us because we offer excellent customer service as well as low prices, but we thought we'd offer you a little extra incentive. For every pound you spend we will give you one loyalty point, equivalent to 1p. 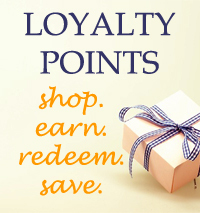 Once you have accumulated 100 points you can use them to get money off future purchases, for which you get more loyalty points and more savings. The more you spend, the more you save. It's as simple as that. We can take any action we believe to be appropriate if we have reason to believe that you are abusing the scheme, including withholding points previously credited to your loyalty scheme account. We may modify the terms of the scheme in any way that we choose at any time. Changes to the terms will not affect points that you have already collected. These terms are valid from September 30, 2015. We reserve the right to vary the redemption value of points at any time. Points may only be redeemed against future purchases. They can never be redeemed in cash. We accept no responsibility for system errors or other issues that may result in disruption to registration or loyalty point redemption.